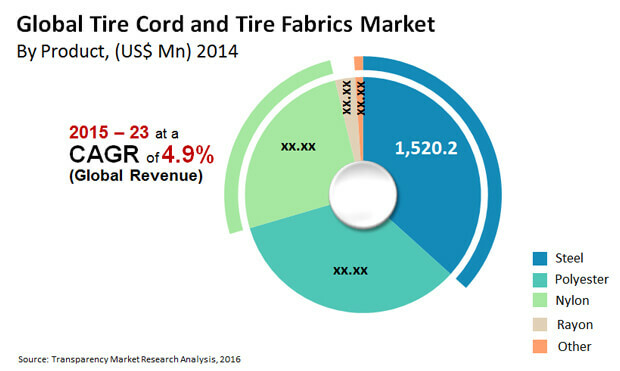 The global tire cord and tire fabrics market is expected to be highly consolidated due to presence of very few companies delivering significant results and highest revenues. The small firms in the market are anticipated to face strong challenge from the well-established companies, leading the market. The major reason behind it is they offer comparatively cheaper product alternatives. These key companies generally bank upon their goodwill and supply agreements in the market to progress. Hyosung Corporation, Kordarna Plus A.S., Cordenka GmbH & Co. KG, Kolon Industries, SRF Ltd., Tokusen USA, and Kordsa Global are some of the key players in the global tire cord and tire fabrics market. According to the analyst at Transparency Market Research, “If demand for tire cord and fabrics rises at a lower rate than capacity addition, even the large players stand a chance of losing their profitability marginally.” The market is estimated to grow at a CAGR of 4.9% within the forecast period from 2015 to 2023. In 2015, the market was valued at US$4.14 bn, which is expected to reach around US$6.37 by the end of forecast period. On the basis of product, the steel segment is likely to lead the market. In 2014, the segment was evaluated to account for over 58% of overall market share. The segment is foreseen to continue dominating the market in coming years as well. Geographically, Asia Pacific region held the major amount of share in the global tire cord and tire fabrics market in 2014. Moreover, owing to healthy growth in two wheelers and automotive market in the mentioned region, it is foreseen to seal its dominance in forecast period as well. The rising demand for automotive all over the world, especially in the developing countries of Asia Pacific is likely to fuel the sales of tire cord and tire fabrics. Since, the market is specifically related with the state of the automotive sector, fluctuations in financial conditions influencing automobile manufacturers as well. It significantly impacts the prospects for organizations dealing in tire cords and fabrics deal. The market experts are putting their bets on these nations. The rise in the middle-class population in China and India has extensively contributed in the soaring demand for car in Asia Pacific, which makes the region the most appealing market for tire cord and tire fabrics. The recovery of the U.S. economy will likewise improve the demand for tire cords and fabrics. The U.S. represents more than 60% of entire market and passenger cars sold in North America. In this manner economic restoration post-recession in year 2008-2009, will fuel the growth in tire cord and tire fabrics in the U.S. This is estimated to be a central point fuelling demand for tire cords and fabrics, globally. On the flipside, in spite of being home to the most significant brands in the automotive sector, a few regions might witness a sharp decrease in demand for vehicles during financial slowdown. The rising demand for automotive all over the world, especially in the developing countries of Asia Pacific is likely to fuel the sales of tire cord and tire fabrics. Economic restoration post-recession in year 2008-2009, will fuel the growth in tire cord and tire fabrics in the U.S. This is estimated to be a central point fuelling demand for tire cords and fabrics, globally.